of production techniques using materials you’ve been hoping to get your hands on (clay, glass, fiber, metal and more). 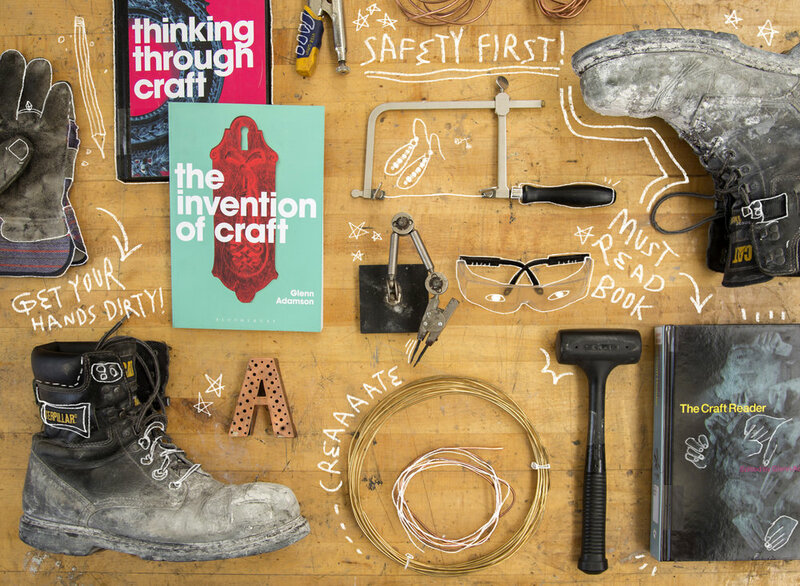 You’ll learn how to make objects that impact economy and culture alike. Contemporary crafters are coming together to visually express their thoughts on today’s most pressing societal conversations, like immigration, identity politics, and feminism. You’ll get access to CCAD’s myriad facilities: wood and metal shops; ceramics, glass, jewelry, and fabrication labs; the Photography studio; and Fashion Design’s fabric room. Second semester is when things get really fun. “You have the freedom to explore all different media — any kind of concept you’d like,” says Tylan McCollum (Class of 2018). You’ll get to use tools like a 3D printer, laser cutters, and a CNC machine that can handle almost any material. There’s a lot of opportunity in Columbus to gain experience off-campus. Glass Axis offers internships and work opportunities, while Hawk Galleries’ visiting artists and Sherrie Gallerie's exhibitions put a variety of techniques and perspectives on display. After graduation, jobs at places like Columbus Idea Foundry and Franklin Park Conservatory allow glass artists to continue to make — a mere pipe dream in cities without such supportive, collaborative communities. With a Contemporary Crafts degree, you’ll be set to run a private studio (and sell work at art fairs and exhibitions), start your own gallery, and teach workshops, either in your studio or at centers across the country. Classes like production Techniques will help you learn how to create multiples of the same item, as well as delve into the practicalities of creating and selling work. And our Business curriculum, tailored for artists and designers, will prepare you to be your own boss with courses in finance for freelancers, starting your own business, and social entrepreneurship. When the German-born, Columbus-raised Julie Abijanac was diagnosed with Hodgkin lymphoma in 2005, her practice completely changed. The large-scale abstract painter learned to crochet and knit, which was a more accessible medium as she received treatment. She began producing fiber pieces and now documents her cancer struggle and survival in digital drawings and relief paper sculptures. Kaname Takada’s lifelong interest in ceramics took root in Kasama, Japan, where he helped out at his uncle’s pottery studio as a teenager. Takada has exhibited work in France, New Zealand, Japan, Austria, and throughout the United States. His work is represented at the Canton Museum of Art, Zanesville Museum of Art, Ohio Craft Museum, on CCAD's campus and at other places both public and private. I have a paper installation in the 9th Triennial of Paper at the Musée de Charmey in Switzerland, and I’m preparing work for a show at the Claypool-Young Gallery at Morehead State University. Columbus has allowed me to comfortably practice my craft and has so much to offer: art, nature, great food, festivals, and an amazing, diverse community. The library. There is nothing like sitting in my studio with a big mug of tea or coffee and flipping through the pages of a book. I work out of my basement studio making both decorative earthenware and functional stoneware pieces. It’s a big enough city but not too big. I have lived in Columbus for almost 30 years and never seriously thought about moving anywhere else. Talking to customers and meeting other exhibitors while my wife and I attend fairs. Yearly trips to Japan also help me reconnect to Japanese ceramics.